I remember working on a treasury and coming across a few items that kept catching my eye. Every time I looked at the shop's name it was Stonehouse Studio. Although I finally did get the treasury completed, Stonehouse stood out and still does. 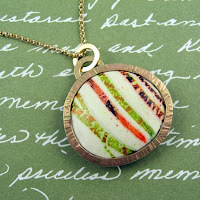 Besty makes beautiful polymer jewelry that is just breathtaking. Her pieces are timeless and unique. I think I love them because they use a lot of my favorite colors. Whatever the reason, each piece is made with great care and attention to detail so each piece is truly a work of art. Besides being a great artisan, Betsy has been a great team-member. When I've asked questions she's been sure not only to give me the answer, but to give me additional resources to find what I'm looking for. She's always ready to share and I appreciate that. I often see her sharing information with the group that is helpful and insightful. It's nice to have someone like her around. So not only does she have fantastic jewelry, she is a really great person to know. Betsy is not the only reason I'm proud to be a part of Boston Handmade, but a good one. Visit her and let her know I sent you. Yikes, you're embarrasing me with all those compliments. Thank you! I love what I do and appreciate it even more because I slaved away in the corporate world for 30 years - now I get to do what I want!